On the day that Venus was visible transiting the sun (June, 2012), I took an afternoon off work - and my son actually had the day off school - the idea being that we were going to go to the observatory on Auckland's Maungakiekie (One Tree Hill), in the hope that we would be able to use one of their flash telescopes to view the event. I wanted my son to be able to see the event especially. 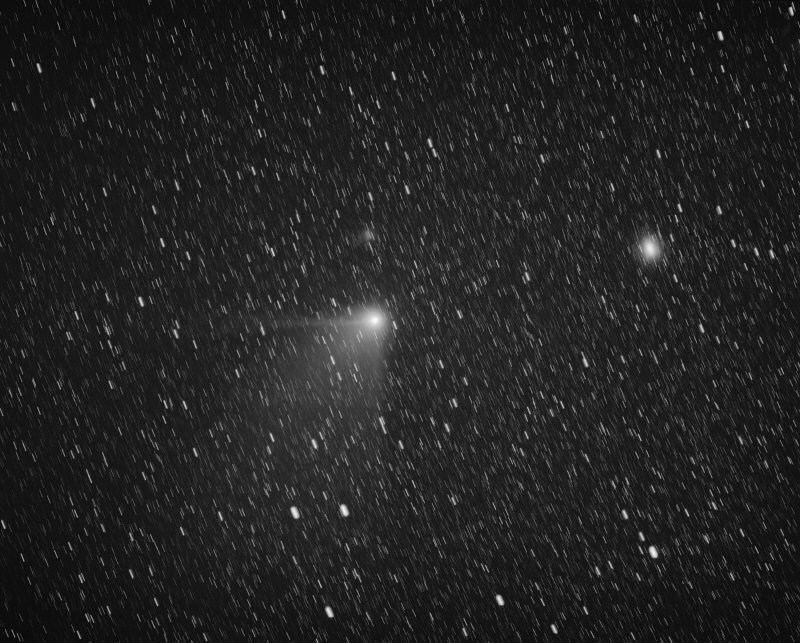 I clearly remember my dad waking me up at about 4:00am one fine night in 1986 to see Halley's comet. I wondered what the hell was going on - we were standing on the driveway of my grandparents home in Birkenhead looking at the sky with a pair of binoculars in our dressing gowns. I distinctly remember thinking that it was relatively warm for the dead of night. It was a smudge in the sky, but there was no mistaking the comet - it was for real and it was magnificent. That was one of those events that I'll remember for the rest of my life; like a lot of boys I guess I was (and still am) more-or-less naturally interested in all things sciencey, spacey and techy. Certainly at some level this event helped reassure me that there was real value for me in pursuing those early aspirations to work with technology. I wanted to create an experience like that for my son. At home I worked remotely from for the rest of the day. Late in the afternoon, toward the end of the transit (which I was tracking intently online) there was a hint of a break in the cloud - a noticed a few shards of sunlight coming through the window. And sure enough, we were fortunate enough to have a clear spell of a few minutes just before the end of the event - we saw the planet! To me events like this are very special and to be treasured - I think that they help remind us of the scale, reality and nature of the universe. They provide the opportunity and motivation to think beyond the day-to-day matters of our lives and consider and address the matter of our existence and our place in the universe - literally, the greater scheme of things. To see with my own eyes the circular profile of our neighboring planet making it's way across the backdrop of our star was amazing. To watch and consider the three/four dimensional nature of the experience - Earth, Venus, the sun, the force that the sun exerts to hold the system together and the steady velocity of the planet - was, well, more than words can describe. As I watched (I couldn't get enough of it) I could almost feel the ever-so-slight re-writing of neural pathways occurring in my brain. What an experience. When I saw Halley's comet I was about 11. 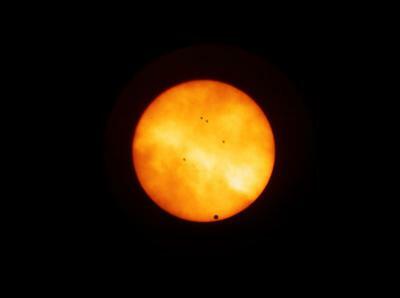 My son was 7 years old at the time Venus transited the sun (in June this year); unfortunately he didn't really understand what he needed to look for and I'm pretty sure he didn't actually see Venus, which although clearly visible by the naked eye, required a bit of concentration to spot. He did see however - and was genuinely amazed by - the clear and perfectly circular disk of the sun, through our eclipse glasses; as did my daughters. My wife saw Venus - she was rapt by that. So we all got something out of the event - it was a great success, the drama was heightened by the fact that we had sort-of waited all day and finally got a few minutes glimpse through the cloud at the very end of the event, in the late afternoon. I can't help but feel just a little bit sad that my son missed seeing the planet. But he was only 7 (I doubt I would have understood what was going on at that age either) and there's lots of time and astronomical events yet to come in his life. Yeah, you can't really see what's going on there - what we saw was much more like the clearer image above. But, you know, at least I tried!